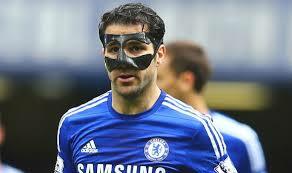 The Chelsea midfielder Cesc Fàbregas has undergone a successful operation to repair his broken nose. The Spaniard suffered the injury in a clash with Stoke City’s Charlie Adam in early April and was forced to play the remainder of the season wearing a protective mask. However, the club has now confirmed the 28-year-old has had the problem rectified and the Spain coach, Vicente del Bosque, revealed at his squad announcement earlier this week that he expects him to feature in the upcoming matches against Costa Rica and Belarus.